… There they were, at the top of Hobbington Long Stair, looking out over the dark forests that covered the steep hills of Hobbington Province. Hermel had taken Star ahead and was quietly speaking with him about his plans for subduing the brigands at Yellow Clay Village. Behind them on Hobbington Wall a crowd had gathered to wish the Archers good luck on their adventure. They waved little red kerchiefs for good luck, and called out their well wishes. It was the case that whenever the Archers left Hobbington friends and family members would gather to pray for them to come back from the perilous journey to the Provinces safe and sound. Often when they did return they were worse for wear, and sometimes some of them did not return at all. Once in a while no one returned at all. It was for this reason that the Province had such a poor reputation, and most people preferred living in the relative safety of Hobbington township high up on Mount Zatok. Hermel and Star were about a half flight of stairs ahead. They noticed that the snow had cleared from the hills below. Spring was approaching rapidly, thought Hermel, worrying himself that they might not arrive in time to intercept the Brigand leader for the trade of prisoners, including Hermel's sister, Alisa, in exchange for the villages’ supply of ‘Spring Seed’. Above them Hobbington was still cold, blustery and snow shrouded, as it often was high up on the mountain, of course. It was a long uneventful, albeit windy, journey to the bottom of the Long Stair. The AAA Group, and the two Dectalions of archers with them, looked around at the steep hills towering ahead. The road at the base of Mount Zatok headed off North and South. Earlier they had taken the Northern Road to the Prancing Unicorn Vale. This time they would take the Southern Road, which wound its way up to a small plateau beyond which the dark hills of the Lupisylva could be seen. The route to Yellow Clay Village was a treacherous one, passing rickety bridges over deep ravines, waterfalls, and fens, among other difficulties. Hermel set the group’s marching order, and handed out the white armbands to the archers and everyone in the company. The point position was given to Praymar, far ahead, followed next by Ishcandar twenty feet or so behind, then Lido another twenty feet behind, and then the main cluster of the party, all of whom were to be followed by the two Dectalions, comprised of ten archers each. One might have thought that Hermel positioned the party members in order of his personal preference as to who should be sprung upon suddenly by monsters and slain first, but that would be absurd. We oughtn't to suppose that Hermel would ever do such a thing. In fact the order was most likely calculated to provide the main body of men the best chance of advanced warning in case of ambush, as he said. On the road leading up to the plateau they could see an old man riding a wagon laden with four pine wood boxes, being hauled by an old mule. He wore a wide brimmed wicker hat, and had stopped within a shallow ravine near some groves of tall pine trees. He appeared to be trying to cajole his mule into continuing the trek up the slope, without much success. They approached closer, but the old man, a weary care-worn seeming fellow, paid no attention to them. He kept his head down, with the hat brim covering his face, and continued with his efforts to get his mule to move, still without success. This might have been due to the fact that the wagon wheels had been braked in place, and could not be budged. The old man said nothing as Praymar passed by him with nary a nod. “Ho there, old man,” said Ishcandar in his friendliest tone as he came up to the wagon ahead of the others, trying to peer up under the wide brim of his hat in order to see the man's face. He caught a glimpse but only a brief one as the hat quickly interceded. The old man didn't respond to him, but tilted his head the more to conceal his withered old face. “What are you hauling?” Ishcandar asked, but the man ignored him, and so he awkwardly continued past the wagon up the road. Lido, as he passed, tried putting his ear to one of the pine boxes to listen within. Perhaps, he thought, if someone were alive in there, he might hear him. But no sound was heard. Lido then tried to get a peek under the old man’s hat, too, but also failed to do so. The others struggled to catch up with them as Ishcandar and Lido tarried just ahead of the cart. Praymar, for his part, had gone a bit further on ahead, and was looking around warily, darting his little red forked tongue and baring his fangs now and then. He caught sight of a small figure wearing a black robe and gray cap coming towards them down the long road from the hills. Suddenly, the old man leaped off the wagon, somersaulting in mid-air, drawing his sword as he landed directly in front of Ishcandar. “I knew it was you!” shouted Ishcandar. “It is a shame you will have to die today, as you had such exquisite wine,” replied Ishcandar. The fifth animal, he thought, must have been excellent at conceiving disguises, as even without his hat the Hobbit could not in the least bit recognize him as the man who had captured Lido and he in the Five Animals Hall. But by his words, he knew that it could only be the Fifth Animal. As it happened the wagon was in a position on the road between two small groves of pine trees and thickly overgrown underbrush. As that spot was rather narrow the cart blocked easy passage along the road. The groves of trees began just where the cart was located, while before it, in the direction from which the party was running up, there was a wide grassy meadow, on both sides of which were steep rocky rises, roughly fifty feet to the north and south. The road was located along the flat section of a low trough between two ridges, both of which were roughly ten feet high. Chickenhiemer noted to Turkenator that such a spot was ideal for an ambush. However, everyone was too busy and excited at the moment to pay any attention to the cluckings of the rooster on top of Bantum's head. Nevertheless, Turkenator flew off of the gentle giant's shoulder and landed near the cart. Although he had no particular advantages in any sort of physical combat, especially with human opponents, the turkey-commander thought it best to position himself where he might be able to do some good, if possible. He gobbled loudly as he did so in an effort to distract the old man with the sword. Arik glared at him jealously. “We’re both short and stocky, but you can fly, while I can’t,” muttered Arik to himself under his breath. In some distant place, Omri, the Earth Lord of the West, smiled, and said to those earth spirits ministering him in his great hall of stone, “Birds fly. Dwarves walk. All is right with the world.” Arik pulled out his battle-axe and ran forward, waddling on his stumpy little legs, vastly annoyed. Ischandar tried his best to strike his adversary with his dagger as the old codger landed, but man's astonishingly quick reflexes allowed him to dodge the preemptive blow. At that moment Praymar ran up behind the villain, and reaching out with his fingers, touched him on his shoulder. The man was immediately drained of some portion of his mystical power. He darted a glance over his shoulder and gave the bizarre little albino a very nasty look. Praymar flicked his red forked tongue and smiled. Bantum lumbered over to the cart, and not being able to get around it without crushing Ishcandar and Lido, picked up one of the coffins and hurled it at the sword wielding man. With surprising nimbleness, however, the man stepped aside with a twist of his torso. In the process, however, the coffin grazed his shoulder, tearing his shirt, and creating a dark blue bruise. The coffin landed with a heavy thud in the dirt at the edge of the grove of tress. The mule hawed and tried to escape his bonds but that was not possible and so he calmed himself and stood stock still after that. Lido crept to the far side of the wagon and drew his bow to shoot an arrow beneath it at the legs of their wily opponent, but the angle was too difficult to manage and his shot swished off into the woods. Star was disappointed to find that Eldrik did not respond to his plea for the Divine Strike at the adversary. He wondered if Sun Lord might still be holding a bit of a grudge against him for having misused his power of the 'Aura Retribution' earlier in his adventures. It was, indeed, possible. Or it may simply have been poor timing, as Eldrik’s attention at that moment might have been elsewhere. The Elkron were awesome and powerful, but one could not say that they were Omnipotent. Like all creatures within the Universe, even the Elkron have their limits. The Archers of the first Dectalion who happened to be in range, maneuvered to a position at the center of the glade where they might have a clear shot, and under Hermel’s order fired a volley at the villain. Their aim was good, and numerous arrows hit the old man. However, none of the attacks struck him in a vital spot, and most simply grazed him, as he deftly dodged the others. The old man, beset by many attacks, nevertheless leaped toward Ishcandar and struck him in the shoulder with his sharp black bladed sword. A narrow wound opened up, and blood began flowing freely from it. Ishcandar staggered backwards with his back against the wagon. He tore his shirt away to look at the wound. It had a black tinge to it. He saw the beginnings of black spidery veins emanating from the wound, heading up his shoulder towards his neck. “Get out of the way!” yelled Hermel, realizing that the best strategy would be for the party members to give way so the archers could shoot without risking hitting any of them. However, not everyone fighting there was ready to disengage, and poor Bantum simply didn’t quite understand what he was supposed to get out of the way for. The old man, realizing that his wounds were more severe than he had expected them to be so soon in the battle, leaped to the nearby trees and vanished into the undergrowth. Lido tried to follow him, but the old man was as wily as a coyote, and hid himself expertly in the greenery. Lido could not see where he was. There was a whistle from the woods, loud and high-pitched. Hermel ordered the archers to move forward onto the meadow and form a line facing the woods where the old man was hidden. “Beware of poison darts!” Hermel shouted to his party members still clustered around the wagon. “Archers,” yelled Hermel next, thoroughly annoyed by his party members failure to adhere to his rather sensible instructions, “if the party members get in the way, mow them down!” This of course was said in the hopes that the party members would get the hint that they should definitely get out of the way. He, of course, didn't really mean it. The archers, however, well ... they were there to follow orders, not make moral decisions after all. Arik wondered if he could set the woods on fire with his mystical lightning bolt, but he thought better of it. Such lightning was not in fact ‘real’, but mystical in nature, and thus it really couldn’t be used to catch things like wood on fire. He muttered to himself about that. Ishcandar, overhearing him, considered what he himself might be able to do to set a fire at the wagon, thinking that a fire might just smoke the old man out of the woods at that. He looked at his brandy bottle. No. It was quite impossible for him to spare brandy for even such a worthy cause. But he did recall that Bantum, a long time ago, had obtained a bottle of the ever so effective Sticky Oil from Hagan at the Rat’s Den way back when. “Bantum!” he yelled, “Look in your backpack for a jar of black oil! Throw it at the wagon!” Bantum followed these simple-enough instructions, and once the jar was broken against the cart, Ishcandar drew his flint and steel, and set about lighting it on a fire. “Look! On the ridge!” yelled Arik as he waddled towards the cart. Up on the southern ridge a band of ten men had shown up in response to the whistle from the woods. They all pulled up bows, knocked arrows, and prepared to fire a rain of death down on those who were in line of sight from the ridge. In fact, Hermel’s Archer Dectalions were the best targets for them, and so they fired at the closest one. Bantum clapped merrily as the cart began to burn, the black sticky oil rapidly igniting from the sparks of Ishcandar’s flint and steel. Meanwhile, at the coffin which Bantum had thrown on the ground, Praymar pried off the lid. He stared with relish at the dead body within. He looked at the corpse to see if there was anything worth stealing. The only thing of note seemed to be a yellow strip of paper written with strange black lettering that covered the man’s face down the center and ended at his chest. Praymar had seen such a thing before. Certain cults in the provincial towns believed that when the dead were being transported to their graves, their spirits had to be constrained by such mystical papers. Otherwise, it was believed, they might break the bounds of death, and their animated corpses rise and terrorize the villagers. “This is stupid!” he squeaked, and thought it pretty rotten that the dead man had nothing of evident value, such as a fancy necklace, bracelet or ring that could be easily seen and taken, and so he left it and went back to watching the battle. As the archers on the ridge were above them they had a distinct military advantage, being defended behind a barrier of stones and having the high ground. However, they were not as skilled as those that Hermel had hired, and so their advantage of position was neutralized by their lack of experience. As there was a stream of water at the base of the ridge, and only one small area where it was possible to actually attempt to climb up, Hermel gave up on the idea of an assault on the brigand archer’s position. He ordered the first Dectalion to return fire, and the second Dectalion to maneuver into a better position to fire up at the ridge as soon as they had achieved line of sight. Ishcandar took a swig of brandy as he sat with his back against a small tree near the burning cart. He looked at the painful wound on his shoulder. Black spidery veins were creeping up his neck. This displeased him to no small degree. Lido came to his side and looked as well. “Aye,” said Ishcandar, not entirely convincingly, as he took another swig from his silver flask. At this time, the short black-cloaked figure with the gray cap who had been waddling down the road from the hills took note of the burning cart and the two groups of men and archers fighting below. He hustled as fast as his little legs could carry him, his handlebar moustache curling and uncurling unnaturally as he did. He was the kind of Hobbit who looked for trouble wherever he went, a demolition expert, and a bit of a loose cannon if there ever was one. He was as it happened, just the sort of Hobbit who might be related to Ishcandar in some way, but neither of them had ever seen the other. He chuckled with glee as he approached, rubbing his hands as he ran. Hermel moved to the trees to take cover. Star followed behind, and took a safe position next to him. Arik ran back to take cover near the burning wagon. The others were already blocked from the line of fire of the brigand archers on the ridge, and so they crouched down where they were. Ishcandar, seeing a fellow Hobbit, albeit an oddly provisioned one, coming down the road towards them, got to his feet, wobbly as it were, and made his way up the road towards him, somewhat delusional at that point from the poison coursing through his veins. The odd fellow traveler was looking forward to seeing, or causing, some mayhem, and was a little miffed to discover that he was in fact a bit late to participate in the battle, as it had nearly ended by then. As Ishcandar made his way on wobbling legs toward the newcomer, the black-clad Hobbit drew his sword, held it aloft, and quickly grabbed Ishcandar around the neck with his free arm. “Friend!” said Ishcandar, “Have a drink!” as he handed the rude newcomer his silver flask with no small pang of regret, as there was little enough left within it. “Sure!” said the black-clad Hobbit, who put down his sword and took a swig from the silver flask with great relish and a wag of his head. “My name is Ipsy!” he announced pulling on the curls of his large black moustache and handing the silver flask back to his new found friend. “Glad to meet your acquaintance, I’m sure. My name is Ishcandar,” he replied uncertainly, and with that sat down on the ground, the Tears of the Black Lotus making him woozy, and beginning to see unnatural colors, and strange shapes in the scenery. Meanwhile, the battle of the Archers did not last very long. Due to their greater experience Hermel’s two Dectalions made short work of the brigand archers despite their better vantage point. Soon the battle was over, and while some of his Archers were wounded in the combat, none of them fatally so, and Hermel was sure that they would be healed sufficiently by the time they arrived at Yellow Clay Village. He ran to Ishcandar, fully aware that the old man had very likely poisoned the drunken Hobbit with the Tears of the Black Lotus, since that was, after all, the villain’s modus operendi as far as he knew. Ishcandar was beginning to hallucinate by that time, though he didn’t mention it. Among the various odd things and patterns in the clouds he saw, there was a pair of peculiarly disturbing eyes, glowing red as coals, peering out at him from inside of Lido’s backpack. It was so bizarre, those glowing red eyes, Ishcandar felt quite compelled to take another swig from his silver flask, which, he noticed with alarm, had become deplorably depleted. As he did so, Hermel called upon Minvar, the wondrous Elkron of earthly healing, to cure the poison in his friend, just as he had done before with Constable Barnstormer. This time, however, Minvar seemed to take no particular notice of his plea. Perhaps this was because he was muttering something about “wretched, no-good, low-down, troublesome Hobbits” as he invoked the Wondrous Elkron’s powers. Shaking his head, and rubbing his eyes, for some of his power had been used up in the effort, he tried again. Again he couldn’t help himself from muttering his annoyance at the irksome Hobbit as he did so, and again the mystic plea went unheard. So, Hermel stood up. He rubbed his eyes and forehead, and took note of the fact that he was now nearly depleted completely of mystic energy. It would take a full night’s sleep for him to recover even a portion of what he had already spent that day. He was thoroughly annoyed. He tried again. Again Minvar’s attention was, so it seemed, elsewhere. One last time, as he had only just enough mystic power to do so, Hermel invoked the healing power of Minvar, and this time, finally, he was rewarded with her attention, and healing effect. Ishcandar slowly stirred from the stupor he had fallen into. He opened his eyes. The black spidery veins emanating from the wound on his shoulder began to recede. Minvar had healed the Hobbit just in the nick of time. Another minute and the poison would have reached Ishcandar’s brain, and that would have spelled doom for the happy go-lucky scion of Mr. Rokkafellah. With this Hermel sat himself against a tree, and rested, muttering about how much he hated Ishcandar. He watched the burning wagon as it caught the nearby undergrowth of the wood grove on fire, it's billowing black plume rising high into the air. He closed his eyes, took his Dragon Stone in his right hand, and rested himself, still complaining rather bitterly, while the others tended to the wounds of the archers. “Oh I’m sure you don’t really mean that, Hermel,” said Ishcandar overhearing the poor man’s complaints, and offered him, out of the kindness of his heart, one of the last available swigs of his very precious brandy. At that moment a little - thwip – sound was heard, and Ishcandar felt a sharp sting on his neck. Grabbing at it with his hand he pulled away a tiny black dart with red feathers. “Oh, no!” he cried out, “Gosh! Again with the Tears of the Black Lotus!” he exclaimed dismally as he sat down with his back against a tree next to Hermel. Off in the woods nearby the old man was crouching behind a tree, very expertly hidden from view, preparing another dart, should it be necessary. There was one thing, for some reason, in this world that the old man truly hated, and that was Ishcandar Rokkafellah! In an odd sort of way, this, unwittingly to them both, kind of made Hermel and he something almost like allies. Except of course, they were nothing of the sort! They only had that one thing in common, and naturally, Hermel, being a good guy, not an evil villain, would never consider hurting the wayward Hobbit, no matter how much he might detest him. In any event, the entire party ran over to Ishcandar as soon as they heard him cry out. However, unfortunately, no one had any idea as to a way to help Ishcandar this time. “We’ve got to get the heck out of here,” said Arik, glaring in the direction of the pine trees. “Yes, we need to get out of range of those trees, otherwise we may all be subject to the deadly darts,” said Star pensively scanning the grove for any sign of movement. 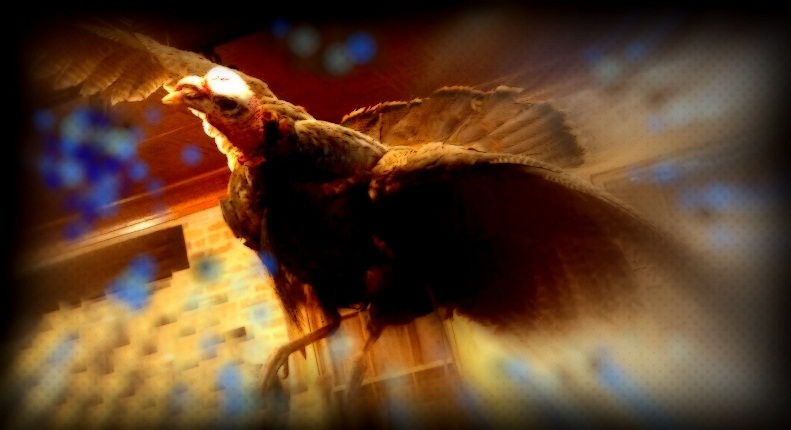 Turkenator flew along the edge of the woods, and unerringly spotted the wily adversary. But it was useless for him to announce that fact, as no one there spoke Chickenese, except Bantum who spoke only a few words, and actually had no comprehension whatsoever of the peculiarities of the Turkey dialect. And so Bantum picked up Hermel and gingerly carried him in his arms, following behind Arik who carried Ishcandar, along with everyone else up the road towards a safe looking bluff up ahead. As a final gesture of defiance, Praymar went to the coffin and tore the yellow paper off the face of the corpse, and tore it into pieces. “I hope you never find the afterworld!” shouted Praymar at the corpse. It was an ill-advised notion that compelled the freakish little albino to do this, though Praymar had no idea what the result of that might be. Once they were well out of range of the woods they stopped and put the Ishcandar and Hermel down, letting them rest. Ishcandar already began to feel woozy. Everyone was thinking hard about what they could possibly do. Even Hermel, who one might have thought would have felt no particular loss were Ishcandar to perish from the horrors of the Black Lotus, leaned himself against a tree, and offered his advice. “Yes, I do recall, somewhat,” murmured Ishcandar vaguely. With nothing to lose and nothing else to try, they decided to give it a go. Star invoked the Blessing, which Eldrik kindly gave, and Ishcandar’s luck held out, and so he was thus able to invoke the mystic invocation of Minvar to cure himself of the deadly Tears of the Black Lotus, which by this time had reached as far up his neck as his right ear. Once again, the thin black veins began to recede, and Ishcandar’s hallucinations of glowing red eyes peering at him from within the folds of Lido’s backpack faded back into the stuff of forgotten nightmares. And with that, and many wary backwards glances the adventurers made their way up the road toward the top of the slope. As they marched an argument ensued as to whether or not they should take the opportunity to go back to the burning grove and make an end of the old man, whom they all presumed was indeed the Fifth Animal, once and for all. “I’m pretty sure," added Star, "if we go back to fight the Fifth Animal at least one of us is going to die. We don’t know where he is in there, and he can shoot us with darts while we blunder around searching for him,” concluded Star, who was not relishing the idea of suffering the horrors of the Tears of the Black Lotus, or watching anyone else do so. And with that they continued up the path. No one seemed to notice that Ipsy had vanished from their party again, without a word of goodbye. 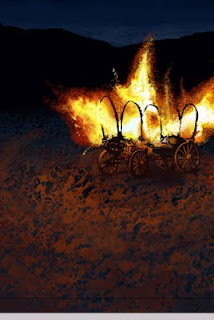 From the plateau the adventures also didn’t turn around to take a final look back, but behind them the black smoke of the burning cart, and the woods which had by then caught fire, rose into the darkening sky. This, any of them might have noted, seemed strangely reflected by the plume of smoke that also rose from Hobbington high up on Mount Zatok, where several fires could be seen having broken out in two areas of the mountain township. And this, it seemed, was again reflected by another far more distant pillar of black smoke that rose from the vale of the Prancing Unicorn Inn, where the disaster of the salt mine had occurred. And so none of them took note of the odd fact that wherever they had recently been, smoke was seen rising into the glowering cloud laden sky. The Elkron, however, as they always do, took note, some smiling, some nodding, and some frowning. The sky was dark with clouds and it began to rain. A storm was coming in. Arik, having let Hermel rest enough, ushered everyone down the road. It took the rest of the day, and well into the night, before they came to Lilac Village. It was a walled township, very prosperous, with lots of two and three story buildings, shops, and guards at the gate, as well as a watch patrolling the streets all night. Explaining their errand to the guards, they were allowed entrance, even at that late hour, and brought by a townsman to the closest Inn. It was a fine place, filled with flaming hearths, plenty of food, drink, comfortable beds, pillows and blankets. And so the AAA Group took rooms there for the night, while Bantum carried Hermel to a bed so he could sleep. The archers, who were on a more modest budget, took rooms in an adjoining building, not quite as nice, but serviceable enough for military men. And so it was that the AAA Group collected themselves in front of a warm fire at a large table, and with great relish ate a late dinner of roasted port, hearty three-grain bread, white butter, honey-mead, and all the trimmings they might have wished. After that, they retired to bed. Meanwhile, the archers, those who had not been too wounded, played dice by the fire, and sang drinking songs long into the night. Somewhere in the distance a church bell rang twelve times, and then even the archers grew sleepy, and so retired drunkenly to their rooms to get some sleep. Outside in the black of night, the rain poured down in heavy sheets. Lightning flashed across the horizon, silhouetting a black figure riding the back of a mule, one fist raised in the air, shaking. Behind the mule were being dragged the charred bodies of four corpses in black burlap sacks, sheets of wet, charred and tattered yellow paper scripted with arcane letters adhered to each. There are some people in life who are very intelligent, perhaps super-genius-level mental giants... who also happen to be unwise. Despite all of that amazing brain power, they still make unbelievably foolish decisions. I know several such people in the real world. One I'm thinking of was studying to be both a doctor and a lawyer... because she could. She had the brains to memorize and cogitate all of that stuff. Amazing. But then she married a biker who wound up screwing up her life and things went south from there. Oh well. She amounted to nothing. But is still amazingly smart at math and figures and history and geology and all sorts of facts based things. Conversely there are some people who are wise, but not particularly good at things that involve Big-Brains. But they make good life decisions, and are happy people, enjoying their less brainy pursuits patiently and without stress or life-disabling anxiety. They are peaceful souls. So that brings to mind that in my original Elthos RPG system I used to have two Requisites, one for Intelligence and one for Wisdom, which of course was gleaned from the original D&D rules. Intelligence was what Spell Chanters want, while Wisdom is what Clerics want. This too was a bit overly simplified, in the sense that there could also be evil clerics, who also make very very bad life decisions. You know the type. Evil, wicked Clerics can do a lot of harm to others as well as themselves, raising undead, sacrificing virgins to nameless deities from the black depths, you know that sort of guy. So it's actually really not quite right that the Cleric should, as a class, require a high requisite. Maybe it should be that the Cleric if Good requires high, but if Evil requires low. So the rule might be better stated as Clerics require an Extreme Wisdom, either high or low. Now, all of this is kind of a problem for me in my new, revised, and vastly shrunk-down-to-size version of my rules system, named Elthos "One Die System". It uses, of course you can tell, one six-sided die. And it also has far fewer requisites... in fact the absolute minimum I could get away with. Strength (which covers Constitution, and Endurance), Wisdom (which covers Intelligence), and Dexterity (which covers in my old system Agility). I dispensed with Appearance, Voice and Charisma altogether. So the ODS has three requisites. And each of the four classes requires some minimum combination of those, as per usual for traditionalist style RPGs. But with only one requisite, Wisdom, it makes it a bit of a challenge. How do I, mechanically, handle the distinction between Clerics and Spell Chanters? Well, in the ODS I don't. I just use the same Requisite, and we kind of glide along with that, with the distinction being simply the Player's option when selecting Character class, and the slight difference that Spell Chanters require a minimum of 4 (out of 6), while Clerics require a minimum of 5 Wisdom to be eligible for those classes. After two years of continuous play testing it has actually never shown up as a problem, nor have the Players expressed any concern about it. So how much does it matter? It depends. If you are playing a Simulationist style game (see GNS Theory), it would probably matter a lot more than if you're playing a Narativist game. In my case, since I tend toward Narativism over Simulationism, it's ok. For other GMs it might not be ok. But for me and my merry band of Players it's been nothing but fun, and so I'm inclined to keep the system the way it is. With the possible exception of adopting this idea that Evil Clerics must have a low Wisdom, while Good Clerics must have a high Wisdom. ...It was a cold blustery morning, and rather early. The sky above was billowing with steely gray clouds as a crowd gathered outside Wuldkarava’s Doggie Emporium. “What’s going on here, my lady?” asked Hermel of an old woman at the edge of the crowd. “I hate to say it, but this may be a job for … the Hobbits,” said Hermel looking at the crowd surrounding the town Board, which happened to be located on the corner of Wuldkarva’s shop. Without further ado, Lido stealthily wove through the crowd until he got up to the front row and looked up at the board. It was a large wooden posting board, bordered with wonderful doggie carvings, of course. There was a large posted notice tacked on it, written on red paper with a purple stripe across the top. The lettering was in fine calligraphy, in silver colored letters. It looked quite festive, in fact. That mysterious message was all it said, but Lido, along with everyone else, could infer from the colors and fancy calligraphy that he was to announce some great festivity, which always companied red colored paper, and a wedding, which was signified by the silver lettering, and that it involved a member of one of the Aristocratic Houses. There was a great deal of murmuring and excitement among the townspeople. Lido returned to the ‘AAA Group’ and explained what he saw. “Well, that was a waste of time,” said Hermel bluntly. “What? Don’t you care what the Mayor has to say?” asked Lido, himself keenly interested in any such great event in the township. “No. All I am interested in right now is getting our provisions, meeting the archers, and departing to Yellow Clay. I have no further interest in the affairs of Hobbitington,” he replied with a determined swag of his shoulders towards Hobbington Gate. Meanwhile, as they were close to the window of the Doggie Emporium, Ishcandar has chanced to look in the window and marveled. There he saw no less than three-dozen thumb sized carvings of dogs of various kinds, each one as unique as it was exquisite in detail and perfection. “That’s astounding,” he thought to himself as he pulled on Lido’s arm and pointed to the rows of wooden doggies. “I must have one for my father!” said Ishcandar, turning to the store’s fat and oily merchant who happened to be at the tail end of a transaction with several people as they were completing their payments. “I’m sure we can accommodate you, sir,” said the merchant with a broad fat lipped smile. “I would like to have the finest of your Dogs sent to my father as soon as possible,” said Ischandar enthusiastically. “Well, young fellow, these doggies can be quite expensive! Are you sure you can afford the finest one?” asked the merchant stroking his chin and looking down his bulbous nose on Ishcandar. “Why perhaps I should,” replied Ishcandar. “But Ishcandar, we’re about to be leaving,” whispered Lido, tugging on his arm. “No, no, it’s ok,” said Hermel, shifting his eyes and trying not to look terribly obvious about his intent. “Let him take a look, that’s fine.” As soon as Ishcandar was safely inside and preoccupied, Hermel planned to slip away quietly with the others and leave the irksome Hobbit behind. “There is no end to the troubles that a pickled Hobbit can bring, after all,” he thought. We shouldn’t blame Hermel for thinking that way. He was, of course, quite correct, you know. However, Ishcandar was too wily to be left behind so easily. “Why of course,” said the Merchant, even more delighted at the ease of the transaction. “If you don’t mind, you may simply sign here,” he said, holding out the hastily scribbled payment scrip and a quill pen, freshly dipped in ink. Ishcandar signed the scrip, for better or worse, and hurried after Hermel, and the others, who had made a sudden departure for Lady Gray’s Tea House under Hermel’s hasty leadership. It was all he could do to keep up. Yet before they could all get more than ten paces a little girl began squealing with unbridled excitement just behind them. Sure enough, when the party turned about to take a look, well against Hermel’s wishes, there was something worth getting excited about. “Now you don’t see that every day,” someone in the crowd said. Hermel was flabbergasted. Who was contriving these distractions from his worthy goal? Some devil from hell must be behind it all! As it happened, little did Hermel realize, but that was precisely the case. And had he not been such a determined, and highly focused young hero, that fiendish devil’s plan might have worked. But this was Hermel he was dealing with, after all, and no distractions would be tolerated for long. “I can’t believe it’s you!” shouted the young artist, Konar Wuldkarva, from the doorway as he stepped outside into the frigid air. “How are you, my friends?” he asked as his friends from the ‘AAA Group’ gathered around to congratulate him. “Did you make these dogs?” asked Lido, when he was introduced. “Why yes, I did,” answered Konar with his usual warm and mild manner. “They’re amazing!” replied Lido. “Did you make this one come to life?” he asked, pointing to the little doggie in the window. “I supposed I did,” said Wuldkarva looking at the little yapper with apparent surprise. “Why, I don’t know!” answered Konar. “It just sort of happened, I suppose!” he said smiling dumbly. “That’s amazing!” said Lido, again. “I’ve never seen anything like it. Could you make a big one?” asked Lido. “I supposed I could,” replied Konar, thinking it over. “Could you make one as big as a house? And make it come alive? So that I could ride around on it?” asked Lido, getting carried away imagining himself riding on the back of a house sized dog as it crushed houses beneath him. “I … I… I don’t know!” answered Wuldkarva trying to imagine how long it would take him to carve a house sized doggie, and what breed he might pick for such an incredible project. “That would be truly incredible!” exclaimed Lido with unbridled enthusiasm. “Sure she can keep it!” answered Konar sharply, putting his foot down as one who created the doggies, and has a right to sell or give them away as he pleases. He was on the verge of being peeved at the merchant, who always seemed to have some reason or other why he should keep working late into the night, and stay downstairs in the basement woodshop. He was nearly fed up with that life as it was. But still, he made an agreement, shook hands on it, and the food was good, even if the pay was … well, not terribly forthcoming, as he had first imagined. With that the merchant glanced around nervously and capitulated. “Ok, ok, why of course she can keep it, you’re quite right,” he said raising his voice so everyone could hear. “It will make the little girl happy, and that’s the most important thing, as you say! And besides, you’ve done a splendid job all along, so we can afford to give, well, one doggie away,” he added, biting his lip and looking with bulging, almost tearful eyes, at the joyful itty-bitty doggie barking merrily in the overjoyed girl’s hand. It would be hard to imagine another circumstance to make the merchant quite so distressed as this, seeing as how this little doggie might have been the only one ever to come alive from Wuldkarva’s works. But bite his tongue he did, and swallowed hard as he watched the delighted little girl run off to show her mommy her tiny new pet. “Thank you ever so much, Mr. Wuldkarva!” exclaimed the girl, whose name was Nancy Beckenham, in case you ever need to know, as she curtsied politely and then ran off across the plaza waving with one hand while cupping the little doggie to her breast with her other. “Well,” said the merchant, “it’s ok to give a doggie away, just this once,” to Konar, “but don’t do that again, ok? We don’t want to make the boss angry, do we? Now why don’t you go inside and have yourself a hearty breakfast and go back to work? I’ll finish things up here and come down to join you shortly,” said the merchant as he eyed the crowd, who were all jostling to get a look at the dozens of doggies in the window. He rubbed his hands. It was sure to be a very good day at Wuldkarva’s Doggie Emporium, in any case. Once the rumor spread, he imagined, why everyone in Hobbington would want one of Konar’s doggies! He was sure to be able to retire a rich man after all. And so, with a big smile and lots of joviality he welcomed his new customers as they crowded around the shop. “Good bye!” yelled Arik over the crowd. “And good riddance!” he muttered under his breath. He, for one, eyed the merchant with a mighty suspicion. How in the name of Omri could a wooden doggie turn into a living doggie! Why it just defied belief, and so he foursquarely refused to believe it. Now, we all might consider that a bit odd, considering that Arik himself was a practitioner of magic, could spark lightning bolts off his beard and hands, and could transmigrate through the earth into a far distant dimension deep within the Realm of the Earth Kingdom. But Dwarves are stubborn creatures of the earth, not easily giving way to new ideas, I suppose. And so Arik refused to believe his own eyes, and stomped grumpily through the snow after Hermel and the others as they departed the plaza in search of Lady Gray’s Tea House. “Those living dogs can’t possibly last for long,” commented Hermel to Star as they walked down the cobblestone streets, crossing a narrow bridge and entering through a tall stone archway into the Old Quarter at the far end of Dunn Street. “As I understand magic, there is only so much mystic energy that those dogs can possess. And I seriously doubt that a larger one could be made to come alive by Wuldkarva. He’s not even trained in magic,” explained Hermel, who knew something of what he spoke. “Perhaps he has a natural disposition for it?” offered Star. “Perhaps,” said Hermel, “but I doubt that. If he had, the Guild would have trained him in it. There’s something odd about it all, I have to say.” To that Star of Justice nodded thoughtfully. After much winding down narrow streets, under and over little stone bridges, and through and between various alleyways, they came eventually to Lady Gray’s Teahouse and entered through the heavy iron-banded wood door, the bell above jingling cheerfully as they did. A cold blustering wind followed them into the teahouse as Arik wrestled the door shut. The other patrons looked up, gazed momentarily, and then went back to their quiet conversations, reading and playing of cards. The room itself was tall and wide, a relic of some bygone age when space in Hobbington was not at a premium, dark and musky with the aroma of wooden cabinets, herbs and a hundred teas. It was elegant, yet cozy with a fire crackling in the deep hearth along the north wall. The old floor boards creaked as the group crossed over to where Lady Gray was sitting behind the long wood counter, surrounded by massive and tall cabinets each with hundreds of knob handled drawers, everyone one labeled with an etched script. Hermel picked up his package, wrapped in paper and carefully tied with yellow twine, as the others went to a table and sat down. The overall air of the place was one of tremendously antiquity. But the lads, excited to be on their way, didn’t pay much attention to any of it, and simply sat, sipping the Jarrow Root tea that Lady Gray brought out to them, at Ishcandar’s request, and munched on the tasty little biscuits she placed before them in a wicker basket. It was warm near the fire, and everyone was content to sit and rest while Hermel finished counting his various herb packets, and ensuring that he had the correct number of doses of Misty Cloud Venom. This, actually, was its colloquial name, as it wasn’t really venom at all. But folks on those days liked to call it that, as it packed the kind of punch that one might expect from a snakebite, except it knocked people straight into Dreamland, rather than killed them. It didn’t take very long, and Hermel paid the old woman, dear Lady Gray, who smiled kindly. “I think you will find the quality of the Misty Cloud quite acceptable,” she said as she tallied up the total cost. “I threw in a few little extras that might please you, as per your request,” she added as she wrote the transaction down in her ledger. He noticed that there were small packages of powdered pixiewick, a bit of bitterbark, cinnamon sticks, and a few other small colorful packets of this and that. Hermel was pleased. It certainly would do. “Look, Henry, at this doggie charm from Wuldkarva’s shop,” one of the patrons was overheard saying. “It’s a lucky charm, I’m told. The merchant claims it will protect me from the evil eye, and a hex or two. Ha. At any rate, it looks quite like a real dog to me,” he was saying as Hermel quietly sidled his way in their direction. The man, who was in fact a bit doubtful, handed over the little wooden doggie to Hermel, and watched him perform his mystical incantation with a raised eyebrow. Mystics, thought the rough city dweller, were a strange lot, best not crossed or casually insulted. After a few moments Hermel handed the doggie, which happen to be a handsome, albeit tiny, Akbash, back to it’s owner. “Wow, what? Huh,” said Hermel. “It is in fact magical. And a protection charm, to be sure.” The man grunted as though he knew it all along and such a thing was obvious, though he said his thanks gratefully enough, and expected to be charged for the service, but Hermel simply turned and walked back to his friends. They debated about how it was possible for Konar to create mystic charms, given that he was only a hair’s breath smarter than a bag of rocks, but they came to no conclusion. And so they left Lady Gray’s with thanks, and went out into the frigid morning gloom. Snowdrifts edged the cobblestone street. A man pushing a rickety old Rat-Stick cart hobbled bye, followed by a train of cats, mewing as they padded behind him. “Let’s go pick up the equipment,” said Hermel. They made their way through the old quarter to the main section of the market district. They came to a shop with a dingy dark green sign and faded yellow script reading “Brian’s Fletchery”. They picked up the bows and the quivers of arrows that Rothmon had ordered on Hermel’s behalf. Bantum hauled them on a wooden beam across his broad shoulders, causing all his chickens to cluck in disarray. Hermel had also picked up several horns, rope and some other equipment. He thought to cut the rope into two-foot lengths with which he intended to tie up the Brigands once they should be subdued. He bought as well a large number of white cloth bands, which he intended to use to mark members of his troop. It was still early in the morning. They headed over to the Five Crows Tavern. The door was closed, but it took less than a few moments for Ishcandar to jimmy the lock with his picking tools and gain entrance. It was dark inside, and cold, but that didn’t matter to them much. They lit one of the lanterns and Hermel got to work with a kettle, three bowls and some linen towels. He needed to brew up the individual portions of the Misty Cloud Venom and apply it to each of the arrows, and so settled down to work. The others sat and took a rest. Hermel, as he mixed and measured the Rhododendron leaves, and boiled the mixture according to what his grandfather had taught him when he was much younger and still living in Yellow Clay Village, reminisced about the story that he was told of this particular concoction at the time. “Now my boy, once there lived a prince of a foreign land, not far from the Southern Boarder of Oswaldia, whose father was assassinated by a poisoner. He grew up in hiding while his mother and younger brother ruled the Kingdom, thinking he must have died in the battles that raged afterwards, as they were unable to find his whereabouts. Over the next ten years time he studied poisons with the Poison Monk of the South, and drank the antidote of many different venoms, steadily, every day, until he built up such a resistance that he could not be slain by any poison known to man. While he was doing this he sent out loyal men as secret agents to his mother’s court with instructions to uncover the plotter. It was, as he suspected, his own mother, who had favored his younger brother for the throne over he. She was convinced by an Oracle upon his birth that he would grow up to be an evil progeny, and that she and her second son, who had not yet been born, would lay dead at his feet some day. And so it was that he returned ten years later, and being the rightful heir to the Throne of that accursed Kingdom, pronounced his legitimacy, and thus swayed the army to his side. When his mother, aghast and shocked at his sudden unexpected return, resisted, as did his younger brother, he had them arrested for treason, and slew them with a poison he dripped into their mouths with his own hand, so that after writhing in agony for ten days they lay at his feet, stone cold dead. And so he avenged his father’s death. Thereafter he was known as The Venom King, and it is said that he became the world’s most profound expert on poisons. Once when an invading army attempted to destroy him, he led them into a Rhododendron forest, which lay across the border of his kingdom to the North. There he had cultivated thousands of beehives for a number of years. Rhododendron, as you have learned, lad, is a noxious plant that causes men to fall asleep, and so the bees taking pollen from their flowers created a honey that had that property. When the troops of the invading army found themselves upon a morning in a forest with honey hives aplenty, and being unsuspecting and lacking in knowledge, made their morning tea dripping the narcoleptic honey into it for flavor, and so every man swooned into a deep sleep before the sun was half to noon. The Venom King then sent in his army to slaughter the entire army as they lay unconscious and dreaming, and so it was that he destroyed the encroachment of his enemies, who were so stunned by such a disastrous defeat, never again attempted the conquest of that wicked Kingdom.” Hermel contemplated this story deeply as he boiled the Misty Cloud Rhododendron toxin and spread the correct amount on each arrow. After a few drinks at the bar, by which Ishcandar inoculated himself against the effects of alcohol, and the freezing temperature outside, he slipped out, with but a word to Lido saying that he would meet them at the plaza in an hour, and headed off to the Iron Horse Tavern to meet his father as the note in his hand instructed. He got there in a short while, and found his father sitting in a private booth toward the back. “Son, son, son, its good to see you so fit and whole after your many adventures,” said Mr. Rokkafellah as he finished quaffing his brandy. “Thank you father. It’s good to see you, too,” replied Ishcandar as his father poured him a glass. “So I have, father,” said Ishcandar puffing out his chest and sticking out his chin a bit. “I understand that, son. That’s why I’m offering you a special post in the family business. I would like you to secure my, eh, investments that I made with that fine young man Hermel, and so to go with him to the village of Yellow Clay. There I want you to survey the town. See what may be worthwhile about the place, take a good look around, and try to find something of worth there that I, er, we might, er, make good on my, ahem … investment, so to say, with that young man, if you get my meaning, son,” he said as he looked around him furtively. And with that they both took generous, even by Rokkafellah standards, swigs of brandy. “Now son, now that we’ve gotten that out of the way, there is one other matter I must discuss with you; one of grave importance, you see… It is about, son, your friend… Lido,” started Mr. Rokkafellah with a lowered voice. His eyes narrowed, and he looked around the room with a sudden suspicion. “Yes? What about my fine friend, Lido?” asked Ishcandar, with a sudden apprehension. “But what, father? I’ve known Lido for quite a long time, and he’s never done anything but a good turn for anyone!” exclaimed Ishcandar. “I can’t explain, son, I’m too shaken up by it,” stammered his father, now breaking out into a sweat and turning pale. “But are you sure?” asked Ishcandar with greater anxiety. “I don’t know, that’s the thing, son! You see, I had this dreadful dream, I think, or at least I guess it was a dream, or I hope so! I don’t know. But whatever it was, it filled me with such a terrible dread! Terrible, terrible. I can’t say anything more about it, son, I’m sorry,” concluded Mr. Ishcandar who had broken out in a cold sweat from head to toe, and gone quite pale, and was trembling. No matter how hard he tried, Ishcandar was unable to get his father to divulge any further details as to what he meant. In fact, so nervous and delirious under further pressure did the old Hobbit become that he passed out on the table. While not entirely uncommon for his father to pass out at the table, it was extremely uncommon, in fact unheard of, for him to express any sort of superstitious fear about anything. He was a stalwart of the old school, and had never in his long life displayed a hint of dread of ghosts, or ghasts, or ghouls, or wraiths, or zombies, or any other form of spectral thing. Not knowing what else to do, Ishcandar finished his father’s drink. It was all very strange. Meanwhile back at the plaza the archers swaggered in from beneath a tall archway, two of whom, the Captains no doubt, came up to the ‘AAA Group’ and introduced themselves, with enquiries as to whether or not they were the men to whom they had been recently assigned for an expedition to the Provinces. “Hello, Bob. I’m Arik. Good to meet’ya,” said he. “Good to meet you, Arik,” said Bob, looking down at the stocky, barrel bodied Dwarve. “What’s the other one’s name?” squeaked Praymar. “Hello, what’s your name?” asked Arik of the next one, ignoring Praymar. “Bo,” said the next one. “Bantum, meet Bob and Bo,” said Arik jovially. “Hello,” said Bantum, looking down on the puny. “Hello,” they replied to the gentle giant as he stood towering with a bandoleer of clucking and flapping chickens strapped across his body, and a live rooster for a hat. “Cluck,” said Dr. Chickenhiemer from his perch on Bantum’s head. “Well, whose running this show,” asked Bob, his eyes nearly bulging out of his head looking at Bantum. “Him, over there,” said Arik pointing to Hermel. With that the two Captains sauntered over to Hermel, their shoulders swaggering in unison. “Hello,” said Bob and Bo together. “So you’re Hermel?” asked Bob. “Yes, none other,” said Bo. “That’s not the pass code,” said Hermel, dissatisfied. “That’s correct,” said Hermel, and from that point on he trusted that these men were indeed the two Dectalions of archers that Guild Master Rothmon has requisitioned for the expedition. They discussed arrangements briefly, and Hermel suggested that they divvy up the bows, and arrows for the journey. This was agreed upon and accomplished with dispatch. Bantum felt a lot lighter. “We will need to purchase rations for the trip,” said Hermel. And with that they turned to look at the chicken vendor where they had bought their rations for the first expedition. All the chickens on Bantum’s bandoleer clucked happily as they began to head in that direction. “Wait, no. Bantum, you stay here,” said Hermel, not wanting Bantum to wind up with two bandoleers of chickens, somehow. “Oh look!” said Bantum excitedly, “chickens!” And with that he stamped off in the direction of the chicken vendor. There in the front yard, gobbling mightily was a rather large brown turkey. “Gobble, gobble,” said the turkey. “Cluck, cluck,” replied Dr. Chickenhiemer. The two odd fouls began a protracted conversation. “It’s his henchman,” said Hermel, his eyes narrow slits as he watched them. “I want that turkey,” said Bantum. “That’ll be twenty Iron for the turkey,” said the shop vendor. That was a very steep price for a turkey. Arik, who was still suffering a bit from the incident with the doggie, walked up to the chicken vendor and asked somewhat incredulously, “Excuse me, I don’t mean to pry, but … isn’t this a quasi-Eurpean medieval style world we’re leaving in? “What’s Europe?” asked the vendor scratching his head. “Let me check,” said the vendor. “Yes. I’m sure,” he said after looking behind him for a moment. “No, don’t carry beaver,” said the vendor. “How about Echidna? Do you have any of those?” asked Arik. “No. I don’t carry those either,” replied the vendor, a bit annoyed. No one carried Echidna in those days. “I only have this many,” said Bantum to the vendor, holding out a few iron coins in his hand. “That’s ok, Bantum,” said Hermel. “I’ll cover you,” he said as he took out twenty iron pieces and gave it to the vendor. “Why so expensive?” he asked of the chicken vendor. The turkey was taken out of the fenced area and given to Bantum, who hoisted the bird on his shoulder. It took a perch there and continued his conversation with Dr. Chickenhiemer. The chickens on the bandoleer all clucked and flapped their wings in a frenetic display of enthusiasm. “Do you have any possums, then?” asked Arik. “No, I don’t carry possums. I only sell chickens, roosters and turkeys. And this is my finest turkey. He’s a big bird,” said the vendor. “He’s going to be a good friend,” said Bantum. Meanwhile Hermel was purchasing other provisions, and providing each member of the ‘AAA Group’ with some money, about one hundred iron each, since he had, he felt, a sufficient surplus to do so. When Lido saw this generous amount of money come to him, he nearly fainted. For Lido, that was quite a lot of money indeed, and probably more than he’d ever had for himself at one time in his life. Bantum, who after many nights of Dr. Chickenhiemer’s careful sub-conscious education in the particulars of Chickenese, understood him to some small degree when the rooster would take his time and speak very slowly with small words to him. And so, Bantum discerned in the “cluck-cluck” that Chickenhiemer was recommending that he should let the chickens all go, and just take the turkey with them instead. But Bantum, who thought of the chickens as his friends now, didn’t want to leave them in the city alone to fend for themselves. Chickenhiemer, however, convinced him that a life of adventure was not really all that safe or suitable for the friendly little hens. “After all, hens like to be safe and comfy in their coop,” he said, clucking slowly. And so, after comprehension came to Bantum eventually, he unhitched his bandoleer and let each of the eight hens off their little tethers. He felt regret at having to part from jhis little friends, but he realized it was for their good after all. Meanwhile Arik, noticing Bantum earnestly talking to Dr. Chickenhiemre turned his head and averted his eyes. Star, on the other hand, watched with a raised eyebrow, as all the chickens were let loose, clucking merrily. They of course were thanking Dr. Chickenhiemer and wishing him and Turkenator a good and productive adventure, and promised to do their best to stay in touch whenever possible. “What’s your game, Rooster?” said Hermel under his breath as he watched these proceedings. But the rooster simply cocked his head to one side a bit, and blinked a few times, with a final “Cluck”. Hermel was convinced that Chickenheimer was not only capable of speaking, but in fact, secretly, somehow, perhaps even intelligent. It seemed absurd, but he considered it at least a dim possibility at any rate. After all, he’d seen some strange things in his short life, and perhaps an intelligent chicken was not the strangest. And with that the chickens, after banding together for a few moments of celebratory clucking, then scattered and flew off in different directions. Their mission had been quite successful, although two of them had lost their lives to misfortunes along the way. And so they sped off to bring their reports to the various headquarters and operational centers throughout the animal kingdom. The goings on of the various parties in Hobbington were of some concern to the Animal Lords, and as chickens spent a great deal of time as trusted members of the human community, at considerable cost to themselves one might add, they were of course the natural selection as spies, and highly relied upon for accurate, albeit long-winded reports. The only problem with them, admittedly, was that they had a devil of a time keeping secrets to themselves, and were notorious gossips. However, as few other races happen to actually speak Chickenese, it was considered a risk worth taking. And so the Chickens made their ways though the snow and ice and over hills and vales and mountain ranges to their assigned HQs. Only two remained behind to keep an eye on things, and took up a perch on top of an awning next to the chicken vendor’s coup, high enough out of reach for them to spend their time safely, and unobtrusively watching over the Main Gate and listening for interesting tidbits of news while they awaited Dr. Chickenhiemer’s return. Arik went up to another archer. “So what’s your name?” he asked bruskly. “Hmmm…” commented Arik to himself. “So far all of their names begin with ‘B’. What other name begins with ‘B’? … Bear!” and with that he developed the paranoid theory that the archers were somehow connected to Lanna and Ben, and could turn into bears. He was pondering this as the rest of the group gathered together and began to turn towards Hobbington Gate. At that moment four trumpets began to blare on the far end of the plaza from a portico on second story of the west end wall. “We should go,” said Hermel, and began walking immediately and hastily toward the Gate. Everyone else looked around to see what was happening. There on the raised balcony of a portico stood Mayor Redmaw, with his trumpeters. He raised his hands to quiet the now highly excited crowd that had gathered around. He brought out two men, one of whom was Senior Borge, and one of whom they could not see very well as he stood in a shadow, as well as two women, both of whom were astonishingly beautiful. In fact, the women looked so similar to each other that they could have almost been twins. They had long locks of curly redish blond hair, and large beautiful almond shaped eyes the color of emeralds. Next to them, at the top of the stairs leading to the portico alcove where they stood was Constable Barnstormer, who was silently directing his men into various positions by means of hand gestures. Troops had taken up positions around the perimeter of the plaza. The crowd lit up with exclamations, and murmurings. Many people were delighted that a festival was at hand. Aristocratic Weddings were sure to put the entire township in a good mood, as gifts and feasts flowed freely on such occasions, as was customary. But others were deeply alarmed at this news. What they whispered, and wanted to know, was what became of Baroness Azize, the Baron’s wife? As cruel and dreadful a woman as she may have been, no one held the view that the Baron could simply hurl her from their marriage without so much as a word in order to take up the hand of Lady Dunn, no matter how wealthy or renowned she may be. Others expressed shock and surprise that Lady Dunn herself would consent to any such marriage with anyone, let alone the baleful and secretive Baron. She was, everyone knew, the most faithful wife who ever lived, pining away while waiting for the return, as she believed, of her much-maligned husband, Lord Dunn. She held, it was said, that he was not dead, but rather that he had fallen into a terrible trap of some kind, and had been hurled, as improbably as it may have sounded, to some very distant land, but that he would return to her some day. Everyone thought that the dear and pure hearted woman had gone mad at the news of her husband’s suicide leap off of Dunn’s Bridge ten years prior, having been discovered in an affair with some woman of mystery at that time. Lies, all lies, she had declared upon hear the news. Everyone assumed that she was a bid mad, after that, but loyal as the day was long. And so the crowd was so surprised and shocked by this news that no one thought very much about Senior Borge’s wedding to the scarcely known Elizabeth Warden. Her father, the old and venerable inventor, stood by, weeping into his handkerchief, but scarcely anyone took notice of him. “I don’t like taxes!” shouted Bantum. People began stirring, and then someone shouted an anti-government slogan. Suddenly it seemed the crowd began to surge towards the Mayor’s podium. And so the archers formed a phalanx and began moving towards the gate. Arik and Star followed behind them, and this was made far easier as the phalanx cut a line through the crowd. Meanwhile Bantum was cheering on the protesters, as Arik who had him by the sleeve pulled him along. Praymar found the riotous crowd ever so fascinating, but stuck close to Star just the same. Ishcandar made his way quickly over to Lido, and the two of them hurried along trying to keep up with the others. Just then Dr. Chickenhiemer clucked a few times, and launched off of Bantum’s head and flew over to Lido’s backpack and landed on it, followed shortly by the turkey who landed on the ground in front of the hapless Hobbits. He clucked frantically as he pecked away at the leather straps. Lido was loath to stop, although he was enormously perplexed as to why the rooster was doing such a thing. The turkey, amazingly, used Turkeyjitsu, a martial art he had perfected over many years, to cause Lido to twist, stumble and fall over (no mean feat as Hobbits rarely stumble), and with that managed to remove Lido’s backpack entirely. Before the Hobbit could regain his feet the rooster had plucked the leather straps open and was pecking frenetically. Four delicately designed metallic components with bits of wire and gizmos on them scattered to the ground. These components were in fact the very same artifacts that Lido and Ishcandar had absconded with quite a ways back when they had first exited through the Dunn’s Bridge Tower basement below Dr. Lobe’s Laboratory, before the burning of the Polyvizus, and their subsequent capture by the Five Animals Society. It was the first time that Lido had even thought of the components since then. “What do you want with those?” he asked the frantic rooster as he made a futile attempt to reacquire the intricate metal sheets, but Chickenhiemer did not have time to explain and simply grabbed the artifacts in his two claws and beak and flew up to a nearby balcony with them, followed closely by the turkey. Pecking precisely while holding the components with his feet, Dr. Chickenhiemer engineered a very delicate, yet exceptionally powerful device. Within a few moments it was complete. He flipped the switch with his beak and a small blue light turned on, emitting a low hum, and as a pale blue translucent light began to expand outward from the device in a sphere. At that very moment, the bell tower on Dunn’s Bridge began to toll somberly in the distance twelve times. Lido had happened to notice that very same pale blue light all around the high tower way over on Dunn’s Bridge, which could just be seen through the buildings and over the rooftops of the town from where he stood. A chill went up and down his little spine, and the hairs of his neck all stood up on end. Hermel at that exact moment happen to be leaving Hobbington. Hearing the Bell Tower tolling, he began to run. As he was stepping beneath the Hobbington Gate Portcullis, however, he began moving slower and slower, and he noticed out of the corner of his eye that everyone, and everything, on both sides of him, also began moving slower and slower, and that a pale blue glow extended all the way to the line over which his foot was just now passing. However, unfortunately or not, and despite his every conceivable effort to hurry himself over the line, he was out of time. And so it was that he, and everyone in the entire township, got caught in a rather vicious temporal distortion, the result of which was that time completely stopped for them all. All of them, except that is, Ishcandar, Lido, Dr. Chickenhiemer, and the turkey, all of whom happen to be standing within a dimly glowing pale blue sphere of their own. Dr. Chickenhiemer adjusted the Trans-Temporal Anti-Distortion Device delicately with his beak to fine-tune it to the precise frequency upon which the bell tower had chimed. It was, for anyone who happens to be interested and knowledgeable about such matters, a perfect C, or 16.35 Hz. Chickenheimer clucked with some satisfaction. He looked around. Not a single mote of dust was stirring in all the township. People stood in mid stride; a box of candy was falling, frozen in mid-air, from a toddler’s hand; a woman was frozen in time as her long silky hair swept past her face in the breeze; a glint of steel was caught on a needle as it suspended high the air motionless. Not a single thing stirred, anywhere. Not even a single mote of dust. At first Lido and Ishcandar were dumbfounded. They looked around and it became apparent that once again Time was playing tricks on them. They realized together that the barely visible translucent blue sphere around them was holding off the effects of the enormous town-sized sphere from Dunn’s Bridge Tower, and that somehow Chickenhiemer, whom they had never met before and had no clue as to his capabilities until then, had somehow cobbled together in a moment’s notice a device that was protecting them from the dreadful trap. “Time flies,” said Ishcandar. Everything had come to dead stop. He looked around. He noticed something on the far side of the plaza moving. It had the vague appearance of some sort of shadowy panther-like creature, perhaps with tentacles, dimly visible, and then only because it was moving. It was making its way through the crowd. It seemed to turn its head toward Ishcandar, and began slinking towards him. Lido, shocked by the idea that such a dreadful creature should have chosen him specifically as its pray, shivered in his boots for a moment and then climbed up quickly to where Chickenhiemer was situated on the balcony. Ishcandar, meanwhile, took a moment to glance around. His eye was caught by something odd. A tiny glint of light in mid air half way between a dark portico on the south side of the plaza, and the portico on the west wall in which the Mayor was standing. The sunlight, which had gleamed in a solitary ray through the clouds at the moment that time stopped, happen to have caught on a slender silver needle as it was in mid flight. “That’s odd,” thought Ishcandar as he traced what looked like the line by which the needle was traveling back to the dark portico on the south wall. There his keen eye spotted a brass tube protruding out from the shadows there, along the exact line that the needle had taken flight. “A blow dart!” thought Ishcandar out loud. Whoever was holding the brass tube was well hidden behind a pillar and could not be seen from below. “An assassin!” thought Ishcandar out loud. He very carefully traced the line from the tube to the needle, and projected forward to see that the needle was poised to strike none other than Constable Barnstormer directly on the neck. Hobbits happen to be good at this sort of thing, you know. “Lido! Act quickly! Go for the dart!” shouted Ishcandar pointing at the glinting needle. Lido, moving with instinctive ease, despite the fearsome situation, grabbed at the Trans-Temporal Anti-Distortion Device, but Dr. Chickenheimer, who was the only one who could handle such an apparatus with any chance of safety, refused to let go of it, and maneuvered so that Lido could not get his fingers on it. Therefore, Lido slung his backpack over his shoulder, picked up Dr. Chickenhiemer and took a leap off the balcony, landing on two feet and ran across the plaza towards where the chicken coup was. This action caused the Trans-Temporal Anti-Distortion Field to move in a sphere with him, which is exactly what he had hoped for. As an experiment he passed the edge of the sphere over the closest chicken in the coop. As he did so it went from frozen outside of time, to clucking and pecking at the ground, not realizing that anything unusual had happened. He carefully stepped away with Chickenhiemer withdrawing the softly glowing sphere from the chicken and it froze in time again. He did this again to be sure. He did this another time to entertain himself. He was going to do it again, but Chickenhiemer clucked with annoyance and pecked him so he stopped that. “You are out of time,… out of time,… out of time…” heard Lido coming from the air all around him. He bolted, running with Chickenhiemer held over his head towards the glinting needle, with Ishcandar and the turkey dashing along with them. His intention was to get the Trans-Temporal Anti-Distortion Field just up to where the needle was, but not actually allow the needle to pass within the field itself. He could see the shadowy beast weaving between the silent and unmoving masses on a course to intercept him. As they moved forward Lido picked a path that had the least people in the way. “Ok, good idea!” shouted Lido. As they passed, people who entered into the Trans-Temporal Anti-Distortion Field returned to normal time and started walking and speaking and acting as they were before. It would take a few moments for them to realize that everyone else, except the Hobbits and chicken and turkey running past, had stopped moving. But Ishcandar preempted their focus on that oh so very salient fact by distracting them. “Here! Have some money!” he shouted as he passed and threw some coins in the air which landed at their feet in a clatter. Naturally they started grabbing at the coins, and so did not take much notice of anything around them. All except one elderly man who appeared to be thinking, and looking off in the direction of the Mayor and his entourage. “Now that’s quite interesting about Baron Azize,” he was saying to his still frozen wife as Ishcandar passed by him in a rush. “Yes it is!” replied the young Hobbit trying to sound nonchalant. “We’ll have to discuss it again some other time,” he added as he hurried along trying to keep up with Lido. As soon as Lido moved far enough along, the Trans-Temporal Anti-Distortion Field withdrew from the townspeople, who were again froze in time, none the wiser, though a few iron pieces richer for their troubles. Ishcandar managed to do this successfully each time they passed people as they became unstuck in time, and so they found themselves just below where the needle was, and no one was the wiser at all. As there were nevertheless people standing within the circle and moving about as though nothing strange had happened, but just dimly beginning to notice that something odd was occurring, Ishcandar threw a large handful of iron pieces in the air and shouted “Free Iron Pieces for the Celebration! But don’t be alarmed by the amazing Festivity that the Mayor’s Mystics have put on for us – I believe it is a Mind-Bending Display you may be noticing! Wonderful! Wonderful!” This was sufficient to distract, ameliorate, and fascinate those people, and also give Lido the few moments he needed to put Dr. Chickenhiemer, and the Trans-Temporal Anti-Distortion which Chickenhiemer delicately clutched in with one talon, on the ground while he hurled his backpack up at the needle, which hung suspended 16 feet in the air, glinting in the sunlight. Chickenhiemer clucked decisive instructions to his friend, who was known in certain circles as “Turkenator”, just as the shadowy panther-like creature slid out into the open from between two people in the crowd. Dr. Chickenhiemer noted that the non-Euclidian Other-World creature had brushed its shadowy tail against the legs of people as it passed them, and those people, poor souls, seemed to turn gray and pale, almost ashen in color, their spirits wafting in the air in subtle near-invisible mists, only to be inhaled through the nostrils of the dreadful beast. Lido and Ishcandar were too absorbed in their immediate needs to take notice of that, however, and so it went un-remarked upon, except by Dr. Chickenhiemer who made a brief and succinct eulogy for each of them. When time came back to those poor people, he knew, they would crumble horribly into dust, rotted through and through by the ravages of time, to the life-altering horror of whomever happened to be around them. What caught his eye most, however, was the fact that one of the persons, a frozen little girl affectionately holding a tiny thumb-sized dog in her hand, was also brushed by that dread tail, but she alone remained the same as she was before. Chickenhiemer was impressed. That little ex-wooden doggie had more power than he had suspected, most certainly. Lucky Nancy survived her brush with death, never to know just how close she had come to utter oblivion. “You are out of time,” said the shadowy panther fixing its hideous black eyes on Lido. “Even the greatest beast is felled by the march of time!” shouted Lido, as he hurled the backpack through the air towards it target, and it was a good shot that Lido had made. It landed, and froze, precisely in front of the needle, so that when time should take hold on those objects again, the needle-dart would invariably collide with the leather missile and thus be prevented from hitting its intended target, the neck of one Constable Barnstormer. At that moment, however, to ruin everything it possibly could, the shadow panther was leaping in the air, and with a paw swung high, caught one of the backpack’s arm straps and swung it so that it flipped out of its current trajectory and froze instead where it would land against the nearby wall, and thus evade the needle-dart entirely. The shadow-creature landed on all four paws between Ischandar and Lido, unfurling its claws, and bearing its terrible fangs with a hideous grin, and a low and sinister growl. Lido did not wait to see what would happen next, but turned and ran back to Chickenhiemer. As he did this, Ishcandar ran to the edge of the translucent pale blue Trans-Temporal Anti-Distortion Field in the direction of the stairway that lead up to the balcony where the mysterious assassin was standing, concealed by the pillar, frozen as he was in time. Ishcandar was to ascend the stairs, reveal the assassin’s identity, and prohibit him form getting a second chance at his little game of darts. Lido, who had picked up Dr. Chickenhiemer and held him close to his chest, was amazed to see Turkenator making an arching flight through the air directly towards the uncanny shadow creature, who had turned about to face the incoming onslaught. Lido’s jaw dropped. He stared in disbelief. Never in his life did he imagine that a turkey could have such courage, nor such grace of movement, nor speed of flight, nor accuracy of attack! But this was Dr. Chickenhiemer’s personal friend, and Lord Guardian of the avian wing of his military forces. Turkenator was no ordinary turkey. His aim was nigh on perfect, and the power of that awesome peck with his beak, and the mystic energies that he summoned behind that blow, caused a resounding bell-like gong to echo through the vast Halls of Eternity. Even the Great Celestial Emperor on his Billion Year Throne, so very distant and high, caught wind of that sound, took note, and commented to his Generals that something in Elthos was curiously happening. And so he sent his man, Ten-Thousand Mile Ears, to go take a listen and find out what it might be. The Lord of Hearing returned in a moment and explained to the Mighty One that a great battle in the Time Plane had, would, and always would be occurring at that moment, which in the Realm of Eternity meant forever, and always. The Illustrious Emperor nodded his head, and peered in the direction of Elthos with some small anxiety. Turkenator had struck the Pantherish creature so hard it skidded across the plaza backwards for about ten feet. It coiled itself, writhing in agony, but the blow was nevertheless insufficient to kill the monster. “I believe it is Night Time!” cried Ishcandar, hoping for the best effect of such a phrase. Sure enough, he was both clever and lucky at the same time, and out from a dark portal beneath the balcony, on which the assassin was standing, emerged the Black Knight, whom Ishcandar and Lido knew to be none other than Lord Dunn. The knight withdrew his shimmering silver sword and charged toward the stricken beast. “Beast,” yelled Lido, “your time is DONE!” It was a rather well considered phrase, and included a clever pun on Lord Dunn’s name. Lord Dunn leaped forward arcing his silvery blade and scratching the creature along its side, creating a long black and painful wound, from which spewed a black miasma. Turkenator lurched forward and pecked savagely at the Shadow Panther’s side, striking it resoundingly with a tremendous thud. Again through the Halls of Eternity a low bell-like tone echoed into the depths of time. The hideous creature curled itself into an unrecognizable shape as it writhed in agony. “I hope that will ‘Buy us some time’!” shouted Ishcandar. This phrase took hold, and the Pantherish Being was briefly caught in its own time eddy, unable to move for a few moments, giving its opponents the time they needed to reposition and strike again. The fact that the dreadful monster was occupied with two very worthy and dangerous opponents freed Ishcandar and Lido to go after the assassin. Lido carefully put Dr. Chickenhiemer down at the precise location where it would allow Ishcandar to climb the stairs and reach just behind the hidden figure. Ishcandar ran as fast as he could up the old stone spiral staircase, as Lido raced to the wall below the balcony and began climbing up. They’d attack him from both sides if they could. As soon as he got behind the darkly cloaked assassin, whose head was covered in a black cowl, Ishcandar pulled out his dagger and gave it a hearty thrust into the assassin’s ribs. Unfortunately, the man himself was still outside the Trans-Temporal Anti-Distortion Field, and when the dagger hit against the softly glowing blue barrier it soundlessly froze in time. This had the strange effect of causing a bit of a short circuit of sorts, and Ishcandar found himself locked in an arc of Chrono-Magnetic current that ran between the point of his dagger, the Trans-Temporal Anti-Distortion Field and the Device. Dr.
Dr. Chickenheimer clucked nervously. The Trans-Temporal Anti-Distortion Device shivered, a spark flew off of it, and it began to smoke. Chickenheimer, however, was a smooth operator. He quickly shifted the orientation of the device to match a new harmonic frequency in the Chrono-Magnetic Field, delicately adjusted the Temporal Oscillator, and clucked a little prayer. That worked, and he gratefully calculated that the device would last, if not disturbed again, for another 17 and eight-tenths seconds. “That should suffice,” he thought. Ishcandar found himself three seconds before he’d struck the erroneous blow. He paused. There was a terrible sense of Déjà vu. He was not sure if he should really go ahead and stab the assassin or not. He hesitated. He stared at the blue glow ahead of him. Meanwhile, the dreadful beast’s black claws had just barely grazed Turkenator, causing him to shrivel up, gray and aged, but still dwell among living. Lido, picking up Dr. Chickenhiemer, shouted, “You big beast, lets see how you like being ‘In Time’!” and with that ran towards the horrid creature. However, the monster was not to be caught flat-footed, and it leaped backwards and evaded the Trans-Temporal Anti-Distortion Field. Nevertheless this action had an unintended consequence. The Trans-Temporal Anti-Distortion Field swept past the assassin, who expectedly unfroze into normal time, and began to move. Ishcandar took the opportunity to stab at him with his dagger. As he was behind the man, his attack was highly advantageous, and he struck with a nasty blow. The man, caught completely by surprise, and in sudden dreadful and shocking pain, spun around drawing his dagger. “You’re gonna die!” shouted Korfu, blood sputtering between his teeth. He struck with his dagger directly at Ishcandar’s heart. Down on the plaza Turkenator, now vulnerable and pathetically weakened by age, was an easy mark for the Time Beast, and with another slash of its claws was on his last, wheezing breath. “Lord Dunn, why don’t you ‘Kill some time!’” shouted Lido with a sudden inspiration. Lord Dunn, fortunately, was able to exploit the phrase, as his wondrous sword struck the creature a fatal blow between its shoulders. A black gap opened up there, and a black miasma began to spew out in an undulating cloud. On the balcony, Korfu, who happen to still have a cold after all, sneezed, tripped, and instead of hitting Ishcandar in the heart as he planned, tumbled over the edge of the balcony, landing at the feet of the dreadful Time Beast with a crushing thud. He looked up with that odd expression of evil men who cannot believe that they could possibly ever fail in life, and at the very end stare disbelieving and bewildered at the fact that they are passing over the threshold of death to Judgment. Yet, Korfu was in fact spectacular in the timing of his ill luck. What Lido saw never left him for the rest of his life. There fell the assassin at the feet of the shadowy beast, his spine snapping with an audible crack. A black miasma opened in the shadows behind him, and the man known as Korfu fell backwards into it, very slowly, as if being stretched for a million miles, shrieking in horror as one being eaten by some vast and horrible nightmare. Far behind Korfu, in the enormous distance, deep in the center of the miasma, Lido thought that he saw something, that at first he took for an eye, then teeth, then tentacles writhing, but that transformed into a scene, someplace, or sometime far away. It was a distant desert, shining brightly in the blazing sun, the golden sands almost white with shimmering waves of heat. 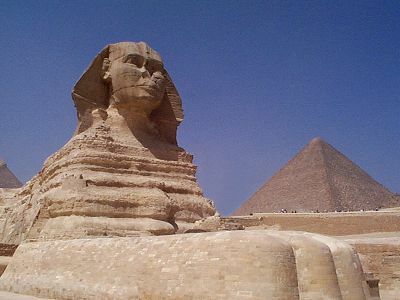 Beyond he thought he perceived what looked to be an enormous triangular mountain, no, a pyramid. And into that, whatever it was, did Korfu stretch, shriek, and, clawing wildly to maintain a futile grip on reality, vanishing into the blackness, which closed up around him and faded away, as did the Time Beast along with him, a strange glowering expression on its hideously baleful face. Lido shuddered horribly, and nearly dropped Dr. Chickenhiemer. With that the Black Knight vanished into a black portico and was seen no more. Ishcandar came down the stairs taking a cheersome swig from his little silver flask. He looked around for the assassin. Not to be seen. He paused, shrugged his shoulders, and took another swig. Lido ran to Turkenator. The poor bird was on his last leg. It looked up with large sad and sunken eyes, withered feathers falling off of him by the dozens. At that moment the Trans-Temporal Anti-Distortion Device fizzled, popped, sparked and died. The Field vanished without a trace, like a burst bubble. Whether or not any time passed, or they were stuck in the Null-Time zone for endless ages, none of them would ever know. However, the temporal distortion coming from Dunn’s Tower also ceased, and everything went back to normal time, everyone started moving exactly as though nothing had happened at all, except that several people in the crowd crumbled suddenly and inexplicably into piles of dust, to the horror of those around them. Hermel exited the Main Gate glad that nothing untoward had happened. And Constable Barnstormer was struck in the neck with a silver needle-dart. He cried out and fell to his knees, grasping at his throat. Lido, who had tried to cry out for Barnstormer to duck but was not nearly as fast as that speeding silver needle, ran with Ishcandar to where Barnstormer had fallen, now leaning against the wall, one hand near his throat. A black spot surrounded the needle. Tiny black lines, like hideous veins were already creeping outward toward the valiant Constable’s brain. They knew that poison well. It was The Tears of the Black Lotus! Having heard the Constable’s cry, and his name being called out by Lido from the middle of the plaza, Hermel turned around. “Why, just why, can’t those Hobbits ever leave well enough alone?” he wondered as he turned himself, begrudgingly, around and headed back to where his stricken friend had fallen. His friends of the ‘AAA Group’ followed behind him, while the archer Dectalion remained near the gate looking around for any signs of mischief. Assassinations were becoming more common in Hobbington of late, and the archers, being very high rank themselves, knew what to look for. Rooftops, dark windows, shaded balconies. But they saw nothing. And so they waited to see what would happen next. However, the archers were no match for Inspector Henderson. He actually caught the glint of the needle dart mid-flight, and instantly calculated it’s trajectory based on how Constable Barnstormer moved when struck. He traced the line back to the dark balcony where the assassin must have been standing. However, he was puzzled, greatly so, as no one was there. He did not need to look around to any other spots, as he knew exactly where the dart must have come from. Therefore, without further ado, quite unobtrusively and unnoticed by anyone made his way up the spiral stairway to the balcony and took a look around. In fact there were two sets of fresh footsteps going up the stairs, but only one pair going down, the smaller set; a Hobbit’s, or a child’s, no doubt. There was an apparent, albeit brief, struggle, as outlined by the patterns of snow, water and blood on the balcony’s stone floor. He picked up a thin brass tube from the ground with a cloth, looked it over carefully, and placed it in his pocket. Apparently whoever had been there slipped, and fell over the edge of the balcony. He looked over. He expected to see at least a spot of blood, and the impression of a man having fallen. In fact, had he not known otherwise in advance, he would have half expected to see a body laying there. Yet there was nothing at all. No impression on the ground, no spot of blood. Just the dim outline of a wide area where the suspect should have landed that looked as though snow hand been wafted aside by a fall. It was, thought the Inspector, very strange. But then, he considered, there were many strange things afoot lately. For example, the fact that just before the Constable was felled by the assassin’s dart, the clock tower on Dunn’s Bridge had chimed twelve times, despite the fact that it was yet two hours until noon. Odd, but there must be a logical explanation, he thought, as he scribbled notes in his small leather bound book. What happened next was that Hermel and the others gathered around Barnstormer, explaining rapidly to the Mayor and those within close earshot that they’d encountered this particular poison before. Everyone gasped. Barnstormer’s head began to loll to one side and his eyes began to roll in his head. A spidery black vein was half way to his left temple. He was, Ishcandar, Lido and Hermel thought, probably already to hallucinating. “Oh Great Minvar,” called Hermel with his hands stretched over the wounded spot on Constable Barnstormer’s neck, “Thou art known to be a healer of all wounds, and a wondrous alleviator of all poisons! Hear my plea; that this righteous and valiant man might not perish at the hands of those whose only motive is dark injustice! Grant him a stay on life, that he may fulfill his duty, and bring Justice to this troubled township!” And with that Hermel removed the needle. Then they waited. It seemed at first that nothing had happened. Then Hermel noticed that the creeping black vein had stopped its upward movement. It then, slowly, began to retreat. Ever so slowly the black line began to disappear, and after ten minutes or so, the only sign of it was the black spot round where the needle had been. Inspector Henderson had come forward, and without much ado, taken the needle from Hermel with a pair of tweezers and put it in a white piece of cloth, bundled it carefully, and put it in his pocket. He gazed out from the balcony in each of the three directions that could bee seen. No further sign of assassins were visible to him. He scribbled notes in his book. The Mayor had already barred the area with guards, and had secreted Baron Azize, Senior Borge, and the two Ladies to side chambers and secured them. “Thank you,” whispered Barnstormer to Hermel, grasping his arm warmly. He looked like he could use a few weeks’ worth of sleep. “You’re welcome,” replied Hermel, now wanted to depart as he felt his duty had been accomplished and Barnstormer saved. The crowd below was in an uproar. People were shouting. There had been horror and confusion. All the good feelings of moments before had suddenly been stripped away. Anti-Government slogans were being chanted. The Mayor, a consummate politician to the last, took the opportunity to try to engage Hermel with flattery. “Young man, that’s an amazing power you have. You saved my Chief Constable. I feel I owe you something,” he said as Hermel drew his cowl over his head. “Sure, no problem. Give whatever you want to charity in my name. That will do,” he said as he walked off and headed down staircase to the plaza, leaving the Mayor standing dumbfounded. As he walked passed a barred window along the stairway, he noticed Elizabeth Warden looking at him from within. He paid her no heed, but continued down the stairs as though he had not noticed the plaintive look in her eyes. She knew, and he did not care, that her life with Senior Borge would be an unhappy existence for her. But seeing Hermel walk away, and her last hope of freedom leave with him, she resigned herself to her fate and turned back to the chamber within. Senior Borge was appraising her with a delighted and leering gaze. Baron Azize was as cold and emotionless as ever. Her only consolation was Lady Dunn, to whom she took an immediate liking, and felt a sense of kinship. The fact that they looked almost exactly the same did not occur to her until just then. “Lady Dunn could almost pass for my twin sister,” she thought to herself. Hermel, for his part, had someone else on his mind. Who that was, no one but he knew. It was his wish, if he could, to meet her again some day, and settle down for the growing of a fine and happy family of his own, in his own town, among his own people in Yellow Clay Village. And so it was that Hermel left Hobbington, leading the ‘AAA Group’, and the troop of archers, out onto the open platform at the top of the Long Stair. Looking out to the vista before him, he felt a sense of relief, even freedom perhaps, now that Hobbington was behind him, and he had gotten everything he’d sought in that boisterous and confounding city. Dr. Chickenhiemer had flown up and taken his perch on top of Bantum’s head, and asked the gentle giant to carry Turkenator to where he might spend his last moments in peace. Bantum carried the poor miserable bird in his arms, feeling pangs of grief to see that in but a moment the great turkey had gone from robust and healthy, to inexplicably old and decrepit. Praymar followed behind, his little forked tongue flicking now and then with amusment, as Arik and Star of Justice followed up the rear. Hermel looked at the miserable turkey as it tried to gobble pitifully, its head lolling over Bantums enormous arm. He shook his head. He knew of no prayer or of any invocation in Minvar’s vast mythos that would restore an ancient to the vigor of their youth. Followers of the Elkron, even the children of the Elkron could not achieve such a thing. The Elkron had that power, and they reserved it for their own kind alone. Star went over to Turkenator and assessed whether or not he could perform any sort of medical healing on the poor thing. But no, as it happened the bird was not suffering from any particular ailment or disease, or wound. He was suffering from a sudden onslaught of old age. For that there was no medical cure. There was another long pause as Ishcandar thought it over. He looked confused. He thought and thought. Then something occurred to him. Dr. Chickenhiemer clucked. He clucked again a few times and hopped onto Ishcandar’s backpack. Inside, though he had no recollection of it at the moment, were more components from Dr. Lobe’s laboratory that he’d pilfered from the open crate they’d found when they had passed through the basement chamber what seemed like years ago. Ishcandar put the backpack down and emptied the contents. The brilliant rooster took the metallic components with the green boards, tiny wires and tiny crystals carefully in his beak and began assembling them. “Ok, well, that’s all very interesting,” said Hermel, seeing only a rooster on the ground pecking at odd bits of metal, which he took to be junk. He scarcely believed the rooster was intelligent enough to remember facts and convey them, but had no idea whatsoever that Dr. Chickenhiemer was actually one of the most preeminent genius’ in the world. So he picked up his things, shook his head at the pathetic hopes of Ishcandar and Lido, motioned for everyone to move on, and so began the long trek down the winding, ancient, snowbound stairway that hugged the steep sides of Zatok Mountain. Chickenhiemer continued pecking, assembling, adjusting, delicately calibrating the device. After a dozen minutes it was completed. He delicately touched a tiny button with one talon. The device turned on. All of a sudden, in the blink of an eye, there was Turkenator, standing before them on the ground, fit as a fiddle, healthy as can be, and with the same youth and vigor that they’d first found him in. They had no inkling at all that while they had stood there, Chickenhiemer and Turkenator had gone on an enormous adventure, spanning several continents, and three ages. “Well, that was interesting,” clucked Dr. Chickenhiemer to Turkenator as they arrived back at the top of Mount Zatok, many years later (by their reckoning). Ishcandar and Lido were delighted to see that Turkenator was instantly back to his old self again, and none the wiser about just how long that took, or how it came about. At that moment the Inter-Trans-Chronological Device quivered, shook, and with a pop and fizzle broke into pieces. And with that, Bantum picked up Dr. Chickenhiemer and put him on his head, and Turkenator on his shoulder, and they hurried after Hermel and the others who were almost two sections down the stairs by then. At the top of the stairs behind them a little gaggle of children waved goodbye from Hobbington Gate, as a crowd watched the archers descend down the Long Stair to the provinces. Jeremy, Nancy Beckenham who happened to be friends with Jeremy, and the Hagglesmiths all waved good bye. The children would often remark on the amazing adventures they’d been on with those great heroes, and later in life would come to emulate their heroic deeds with deeds of their own.